To register your Great Dane, email the information listed below to Kathy at chf-sims3@hotmail.com. Please submit 4 pictures, along with your application. A certificate will be emailed to you, and I will add your Great Dane to the registry. If you have additional questions, please email me. 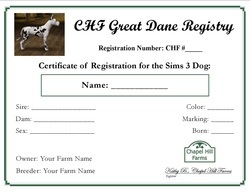 Chapel Hill Farms is the certified registrar of Great Danes for the Sims 3 Kennel Association.